(From Pentax lens literature) The Pentax SMC P-DA 18-55mm ƒ/3.5-5.6 is recommended for use with digital cameras. Ideal for beginners, it provides a focal length covering a wide-angle to moderate telephoto range. Like all Pentax lenses, the SMC P-DA 18-55mm ƒ/3.5-5.6 zoom lens is treated with Pentax's acclaimed SMC coating for maximum light transmission, sharp definition, and high contrast while minimizing flare and ghost imaging. The Pentax 18-55mm ƒ/3.5-5.6 is the ''kit'' lens sold with the K10D and K100 (and previous ''*ist'') digital SLR cameras. It is designed to fit a camera with an APS-C (''subframe'') sensor, so while it will mount on Pentax film bodies, it will show obvious vignetting when set to any focal length wider than 24mm. The lens ships with a petal-shaped hood, and while it comes standard with several body packages, you could probably find it on its own for less than $100. Most ''kit'' lenses give a fairly respectable zoom range and above-average performance when stopped down to around ƒ/8. I'm happy to report this version of the Pentax 18-55mm ƒ/3.5-5.6 pushes the envelope to some degree. The lens never exceeds three units on the blur chart, regardless of the focal length and aperture combination, which is fairly remarkable considering the range of focal lengths available. Wide open and wide angle (18mm at ƒ/3.5), the lens provides a fairly sharp image hovering around two blur units on the scale, though the center is sharper than the edges. With a difference of one unit between the center and the edges, I imagine this difference would be difficult to detect. Stopping down to ƒ/5.6 provides uniform sharpness at just over one unit. Zooming out towards 35mm one can see similar performance, but at 35mm the image is remarkably sharp at the largest available aperture, ƒ/4.5. Sharpness at this aperture is almost identical to sharpness at ƒ/8, and I would suggest that either of these setting combinations would be optimal for this lens. The lens still performs well zoomed in all the way to 55mm, with good performance at ƒ/5.6. As the aperture is stopped down you do encounter diffraction limiting at apertures greater than ƒ/22. Even there, where other lenses show wildly soft results, the Pentax 18-55mm ƒ/3.5-5.6, as mentioned previously, doesn't exceed three blur units, and the image quality is uniformly smooth across the frame. All in all, for the money you'd pay for this lens (or didn't, if it came with the kit), this is outstanding performance for sharpness. Wide-angle lenses typically have some issue with chromatic aberration, and the 18-55mm ƒ/3.5-5.6 doesn't escape this trend completely. Set to wide angle (18mm) you see the worst results, but pleasingly, only at smaller apertures. At ƒ/4, you actually get the best performance out of the lens for resisting chromatic aberration. As the aperture decreases, the chromatic aberration becomes more evident. Even here, the lens doesn't exceed 9/100ths of a percent of frame height which, while noticeable, isn't the worst we've seen, and that's with the lens set to ƒ/22. With the focal length set to anything greater than 18mm, chromatic aberration decreases significantly, until by 35mm the effect is negligible. The Pentax 18-55mm ƒ/3.5-5.6 does present some corner shading in certain situations. Set to wide angle (18mm) you'll get about 2/3EV darker in the corners when set wide open to ƒ/3.5, but this is about the worst it gets for this lens. At 18mm, corner shading never really goes away - it approaches 1/4EV at ƒ/22 - but set to other focal ranges, the effect is more tolerable. It's noticeable at any focal length below ƒ/8, but otherwise, the effect is negligible. Happily, the lens seems to be optimized for the focal length of 35mm, so setting it here, even at ƒ/5.6, produces non-vignetted results. 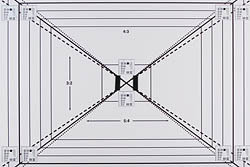 Being a wide-angle lens, distortion comes with the territory when set to wider angles, and because of a simpler design, the distortion gets somewhat complicated when zoomed in greater than 35mm. Beginning with the wide-angle picture, distortion approaches 1% barrel in the corners when set to 18mm. This is fairly typical of lenses with this focal range, and the distortion is uniform throughout the image. As the focal range approaches 35mm the distortion approaches 0%. Zoomed in past 35mm, some pincushion (''squeeze'') distortion results in the corners, however this is complicated with some lingering barrel distortion re-appearing in the center. This effect is significant on our chart, but may be hard to see on a print, as the effect is less than 0.25% in the corners. However, if straight lines are important to you, than shooting outside of the focal length of 35mm will be asking for a bit trickier correction in your image processing software. Autofocus timing depends largely on the body the lens is mounted to, as the lens is mechanically driven with a screw. On a K100 Super, the lens is surprisingly quick to focus, at less than one second to rack through the entire range. Being mechanically driven, the lens does make some noise while the lens does a full-range focus. Point to point focusing on the K100 is very quick, and comparatively silent. The Pentax 18-55mm ƒ/3.5-5.6 isn't a dedicated macro lens, and this shows in its maximum magnification of 0.33x and close-focusing distance of 25cm (around 8 inches). Not bad, but there are better dedicated lenses. At only 225 grams (7.9 oz), the 18-55mm ƒ/3.5-5.6 is very light, but its construction is very solid. The mounting plate is metal but I suspect the filter ring is plastic. It has some nice finishing touches such as a distance scale, and the ability to override autofocus and focus manually by just turning the focus ring at any time (you don't need to switch it into manual). The lens hood also gets special marks in my book for having a removable plate that lets you have access to, and turn, a mounted polarizer. The lens hood also mounts backwards for easy storage, though it's not easy to use the lens with the hood mounted this way. Speaking of polarizers, mounted filters won't turn when the lens is zoomed or focused, which is always preferred. It's not a constant-length lens, in that as you select a different focal length by zooming the lens will change its length. It's at its smallest at 35mm, and the lens will extend out at any other focal length from there. Zoom and focus rings take a little more than a quarter turn to run through their entire range, and the rings are well textured and smooth to turn. Slated to be available in March 2008, it remains to be seen whether this upgrade will be a better performer than its predecessor; according to the specifications, there is one less lens element and it magnifies a hair more (0.34x instead of 0.33x). However the lens could be completely redesigned, to give improved performance. We haven't yet tested this lens, but it's clear just from the price difference that Pentax has put a bit more technology and design behind this lens. The build quality of the 18-35mm is a bit more economical, with a plastic lens mount, but it's a full-frame lens. Optical quality is very good, but comparable to the 18-55mm, so there's not much point unless you're mounting on a film body. The Sigma comparable for the focal length and aperture range, it costs about the same, but unfortunately, I can't tell you how it compares because we haven't tested it. With a bit more reach on the Pentax, everything (especially cost) being about even, I'd go with the Pentax. I was initially skeptical of the Pentax kit lens, but in the final analysis I can report that Pentax has produced a solid lens, with very nice handling and excellent optical properties. It has a few small problem areas - some trouble with chromatic aberration and an odd distortion pattern - but this is a sub-$100 lens we're talking about here. They say you get what you pay for, but in this case I think you get a little more than what you pay for. for 55mm I take f11.sharp up to the corners and better resolution than 1.4/50 in the corners. oh - you must change proram in k-x k30 k5 etc. "elíminate CA's!! very important. Decent results around 28-35mm, nice build quality for a kit lens. - It’s cheap and easy to find. - Overall performance is pretty good for a kit lens. Especially at around 28-35mm in focal length. - Good build quality for a kit lens. - The zoom range is convenient. - A nice lens cap and hood. - It’s easy to come by and cheap, so you are more prone to take worthwhile risks you wouldn’t usually with more expensive lenses. - A super small aperture, up to f40 depending on the focal length, is available. - Focusing speed is fast and reliable as it uses the screw-drive mechanism for auto-focus. - Quick-shift and Super Protect lens coating. - The front barrel does not rotate when focusing, so filters like a circular polarizer work well. - It covers focal lengths I prefer to use prime lenses at. - I’m use to fast prime lenses, so this lens can feel a bit debilitating at times. This is less of an issue with a camera that has strong high ISO abilities like the Pentax K-5. - This is said to be lesser in optical quality compared to the AL II version of this lens. - 52mm filters are a bit odd compared to most of my other lenses that have 49mm, 58mm, 67mm, and 77mm. - Hexagonal blur highlights for most of the aperture range due to the 6 straight blades. - No aperture ring, but this is a “feature” of newer lenses in general. - The focus ring rotates when the camera is auto-focusing. - Prone to flare at wide angle (I don’t have a lens hood, so I’m not sure if that would help). - Vignetting is an issue for a large part of the wide end of the lens. You can see more info on my blog about the lens (pictures, a video, etc). Great starter lens. Excellent build quality, light weight and comfortable to use. Good for use in outdoors, while traveling, or people starting out in photography and not demanding a lot in their equipment. The variable aperture (like most cheaper zoom lenses) means that this is not a great lens for shooting indoors or dimly lit places without flash. AF makes quite a bit of noise, okay fast on my K200D, and very accurate. Love the quick shift manual focus. This is the kit lens that came with my *istDS, and I've used it a LOT. I got so used to it and it's results, that when I switched to using a 50mm prime instead, I was blown away by the saturation, contrast, and sharp photos that the 18-55 can NOT do. So, bottom line in terms of image quality, this is not a spectacular lens. However, it is a great little size to carry around and covers the perfect zoom range for most settings. It's very nicely built, sturdy and rugged. It feels much more substantial than the equivalents I've tried from Sigma or even Nikon. I love having a REAL FOCUS RING. Some lenses these days don't. Also, it focuses fast and works perfectly with my TTL flash. It's a little limiting in terms of aperture, but nice in good lighting. Also, one "CON" that I really enjoy is the distortion at the lens's wide end. Towards 18mm, it does do a subtle fish-eye effect on my *istDS, which, I think is really cool. It's made for some cool, slightly distorted shots. Photos I've taken that feature tile surfaces really emphasize the effect, it's weird. If you're shooting architecture, maybe this is not your lens. So, it's a full little lens that is sturdy and handy. It's not a good choice for taking full advantage of your Pentax SLR's sharpness or contrast, but it's so easy. For the money, this lens is really quite amazing. I had the chance to pick this up used from someone who had gotten it as a kit lens. I wanted an everyday, I really don't care if it gets scratched, walk around lens. To my suprise, the build quality was better than almost every other kit lens I've seen, especially for the price (even at the suggested retail price). It auto focuses suprisingly fast and accurate. The only thing I will say is that the optic quality of this lens is what you would expect for a $100. 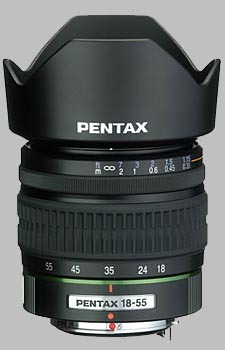 If you have the opportunity to acquire this lens with a new Pentax ... do it, you will find a use for it. For a kit lens, it has very high build quality and acceptable image quality. See pros and cons above. It's above average for a kit lens, and hard to beat in terms of value for a $100 3x zoom. Still not great optical quality though. This lens came with my *ist DS and I am very pleased with it. I use this exclusively indoors with flash, and get consistently good results. Construction quality is very good. I cannot foresee upgrading this lens in this zoom range even if a hypersonic motor version comes out that is compatible with my camera. Sturdy lens mount. Seems to be fairly rugged. Excellent print quality both resolution and color up to 11x14". Auto focus is quick & accurate. Lens is fairly small and easy to use. Can adjust manual focus without activating the AF/MF setting on the lens. Visible barrel distortation at 18mm not a problem. Very slight pincushioning at 55 mm not a problem. Light falloff at the corners is very slight and virtually nonexistant unless shooting at f3.5. In my opinion this is very, very good zoom lens. I got this lens as part of the kit with my *istDL. Its a great lens to start with. Covers a good range for basic shooting. It is very light and small. Max aperature is a bit slow for low light shooting, but very typical for a Kit Lens. This lens is a great value - image quality far exceeds the price you end up paying for it with the kit.